DTI rifle buried during "torture-test"
There was a time when a certain segment of firearms enthusiasts had a less than favorable view of the AR-15 in regard to reliability; and there was a time when the weapon platform had a few possible inadequacies in regard to reliable function. I truly believe that time is in decades past; quality, dependable AR-15 rifles are the current norm. As long as the owner provides a typical amount of maintenance and care, this weapon offers the same reliability of most other modern semi-automatic battle rifles, and accuracy typically above its peers. The "torture test" we did in one of our past blog posts and those done in an even more extreme manner by others in the industry have proven this weapon to be more than reliable for any application in which its owner may employ it. But, there are times when things may go wrong and your weapon experiences a malfunction. This blog post will highlight some basic considerations about what may be causing the malfunctions and how you may be able to restore the weapon to a dependable working condition. When loading a magazine into the magazine well of the rifle, be sure to firmly insert it. You don't have to wail on it like crazy...but after inserting it, a firm tap on the bottom of the magazine with your palm will ensure that it is in the proper place for reliable feeding. It's not a good idea to hold the weapon with your support hand in a manner that allows your hand to contact the magazine or to use the magazine as a "monopod" (allow it to firmly touch a hard surface such as the ground or a bench while shooting). This pressure can cause the magazine to rock into a position that can cause feeding issues. 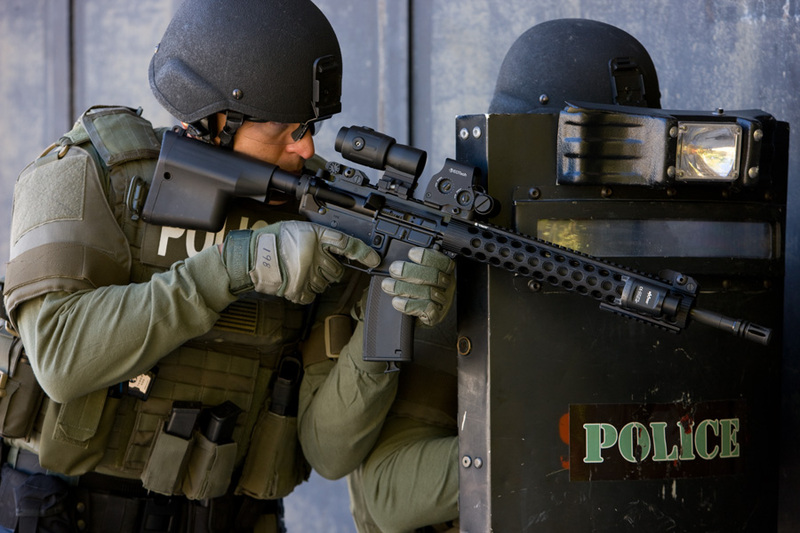 That is one reason why a grip like the one pictured below can be problematic (in the photo below, the LEO is restrained by his current environment and application from using an extended grip) and why the extended arm support hand grip where the weapon is held much further toward the muzzle by the support hand is a better idea. It also offers the benefit of increased control/rapid target acquisition. When loading a round into the chamber from the magazine with a closed bolt (using the charging handle), make sure not to "ride" the charging handle forward when releasing it. This can cause the ammunition to cant and have a more difficult time chambering properly. Pull the charging handle back, and let it go (of course while keeping standard firearms safety rules-muzzle on target/finger outside of the trigger guard). There is a forward assist on most modern AR-15 rifles. You shouldn't have to use it. This feature is nice for a weapon that has a heavily fouled bolt and chamber due to extended battle use, but its use should not be necessary for the average owner of a clean AR-15. So you have a round in the chamber and have pulled the trigger, but there is a failure to fire. What now? Keep the weapon pointed in a safe direction and after waiting for a minute or two (due to the very rare chance there is a delay in the primer igniting the powder) attempt to extract the round using the charging handle to move the bolt and carrier assembly rearward. It could be a bad primer in the ammunition. It could be bad ammunition. It could be caused by accidentally forgetting to install a firing pin after cleaning the bolt and carrier assembly. Inspecting the bolt to make sure all parts are installed correctly and lower receiver parts are correctly installed and functioning properly should be your first course of action once the round is extracted. Another consideration is to see if the ammunition itself may be at least part of the problem. Due to the demand for ammunition being high, it is rare that one can purchase large quantities of ammunition anymore; but honestly, it may not be a great idea to do this even if you come across a deal. It hurts a lot less to have 2-3 boxes of ammo that do not perform than it does to have an entire case that is questionable. AR-15 rifles may prefer one type of ammo over another in terms of accuracy, but any commercially made (especially domestically produced) ammunition should be reliable in an AR-15. Simply trying another type or brand can help you diagnose whether the problem is being caused by the weapon or a bad round/box of ammunition. Here is a link to our past blog post on ammunition considerations: http://blog.del-ton.com/2012/05/feeding-your-ar-15.html. Cycling issues (failure to extract/feed), are typically caused by an issue with the gas system. It may be that there is not enough gas pressure produced by the fired ammunition and bad ammo is the problem, but cycling issues can also be a result of failures in the parts of the gas system. A clogged gas tube, an improperly installed gas tube or gas block, a broken extractor or ejector, damaged gas rings on the bolt, a leak around the carrier key or past the bolt...even parts modified from the original design can cause these type of malfunctions. Whenever modifications to the original design of the weapon are performed (or even disassembly, reassembly, or new installation) be sure to check and double check that things are in the correct place. One example of a modification that could cause cycling problems might be using a new upper assembly with a different gas system than the one that was originally on your weapon (a dissipator-style gas system or those on a short barreled rifle may require that you modify other parts of the entire weapon system to ensure reliable functioning, especially with a particular type of ammunition). The changes in gas pressure and timing from various lengths of gas systems may not work as well with heavy buffers in the stock or a heavier bolt carrier. Just some things to consider if you have made modifications and suddenly experience functioning issues. Here is a link to a previous blog post that gives basic information about the various gas systems used in the AR-15 weapon platform: http://blog.del-ton.com/2012/01/ar-15-gas-sytems-and-operation.html. As stated earlier, even something like normal disassembly for cleaning and maintenance can cause problems if parts are not reassembled correctly. For instance, make sure the gaps in each individual gas ring on the bolt do not line up together after they are removed and replaced or moved during cleaning. At DTI, each and every rifle and upper receiver assembly is test fired to ensure reliable functioning and inspected before it is sent to our shipping department and on to the consumer. Each and every one. If there is ever an issue with how your DTI AR-15 is functioning, we will do our best to remedy the situation as quickly as possible. This post mentioned a few simple, suggested things to consider before contacting us. However, if you have any questions about your weapon malfunctioning or need assistance, please contact us. That is why we are here. That is why factory built Del-Ton rifles have a limited, lifetime warranty to the original owner. We stand behind our products. Thanks for reading our blog. If you have any questions about Del-Ton rifles or the parts we sell at www.del-ton.com, please contact us. For someone new to the AR-15 weapon platform, weapon cleaning and the disassembly associated with it can be a little worrisome. The AR-15 is a battle weapon, and despite all the opinions of the "pro-AK" crowd, it honestly requires very little maintenance and is a very rugged and dependable design. Normal post-shooting cleaning and maintenance, however, will provide a long and dependable service life of the rifle and its parts. We have detailed a simple cleaning procedure in a previous blog post, but this one will focus on the bolt and carrier assembly exclusively and in greater detail (rather than the entire weapon overview provided in the earlier post on the subject). ﻿﻿By pushing out the rear takedown pin on the left side of the weapon, the upper receiver of the rifle will pivot on the front takedown pin and allow you access to the charging handle and bolt and carrier assembly for removal. Pull on the charging handle as you would to chamber a round and the bolt and carrier assembly will slide out of the rear of the upper receiver. The first step in disassembly is to remove the firing pin retaining pin; you may be able to do it with your fingernails but if not, a small pointed object like a nail can begin to free it from the carrier. Make sure to set any removed parts aside safely so they do not get lost. Once the firing pin retaining pin is removed, the firing pin should slide out of the bolt and ﻿﻿carrier assembly if it is tipped up. If it is heavily fouled, you may have to pull it out towards the cut out in the rear portion of the carrier. The retaining pin may not require much cleaning, but there will likely be a build up of fouling on the firing pin itself, especially in the area where the retaining pin holds it in the bolt. Heavy build up may require soaking in a solvent, but typically a toothbrush or light wire brush can remove just about any amount of fouling. Once the firing pin is removed, the cam pin should be rotated so that it can be removed from the bolt and out of the top of the carrier, right below the carrier key (the bolt must be in its rearmost position to allow you access to remove it). Light cleaning is also usually all that is necessary for the cam pin. Once it is removed, the bolt can be pulled out of the front of the carrier. This completes our suggested disassembly procedure for the bolt and carrier assembly. For typical maintenance and cleaning, we do not suggest removing the extractor or ejector parts of the bolt. A dental pick or similar instrument can remove any fouling buildup from right under the extractor claw on the bolt face and a toothbrush and light solvent should be all that is necessary to clean this area of the bolt. Running the solvent soaked brush over the gas rings on the bolt is a good idea as well, but always make sure the slots in the gas rings are not aligned once you have done this and before inserting the bolt back into the carrier. Having the gaps in the rings aligned can cause excessive gas leakage to pass by them and affect the cycling of the weapon. Carbon fouling can really build up on the tail end of the bolt, so special attention should be focused here. A light coat of oil on the bolt (except for the bolt face) should be the last step in maintenance before reassembly. The internal areas of the carrier may require solvent and brushing to remove carbon fouling. Any weapons cleaning product purchased at a sporting goods retailer can accomplish this, though most people have their favorite brands. In our earlier blog post on cleaning the AR-15, we provided the names of a few of the most popular brands and their benefits. Insert the bolt back into the front of the carrier, making sure the cam pin hole in the bolt is properly oriented for the cam pin slot in the carrier. If you look at the bolt face "head on" the extractor should be at the 11 o'clock position. The cam pin will only go into one side of the bolt, so if it is not fitting, check and make sure the bolt and extractor are oriented as stated above. Once the cam pin is inserted into the carrier and bolt, the firing pin can be inserted into the tail of the bolt from the cutout in the back of the carrier. The cam pin must be oriented perpendicular (in length) rather than parallel to allow the firing pin to be inserted all the way. Now that the firing pin is in, the last step will be to put the firing pin retaining pin back in to hold the firing pin inside the bolt. Pull and push on the bolt (imitating the cycling of the weapon) to make sure the entire assembly is correctly assembled. Fouling build up in the barrel, chamber, barrel extension, and bolt and carrier assembly can cause malfunctions and decrease the productive lifespan of your weapon. It is best to clean these areas thoroughly as soon as possible after a typical shooting session. It can seem difficult to new owners and time consuming to all to pay attention to and disassemble all of these parts...after doing it a time or two, you will find you have become more proficient and knowledgeable about the key components of this weapon system and how it operates. Here is a link to our website with a diagram of the bolt and carrier parts: boltandcarrierparts. Thanks for reading our blog. If you have any questions about bolt and carrier assembly or maintenance or about the rifles we produce and parts we sell at www.del-ton.com, please contact us.